Thinking about building your own vacation home? Remodeling the one you currently have or need to replace the cooling and/or heating system? If so, we think you should consider a ductless mini-split air conditioning unit. 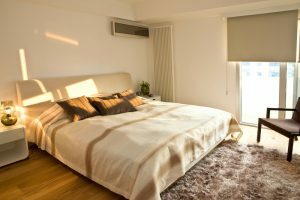 While these systems do have a higher upfront cost compared to traditional ones, they offer unique benefits for your vacation home. Traditional central air conditioners utilize a single unit to produce cold air which is then distributed to different rooms in a house via ducts. In contrast to this, a ductless mini-split has a single outdoor unit with conduit lines containing refrigerant and power connected to interior wall-mounted blowers, up to four per unit. Each of these blowers operates independently from the others, so there can be separate thermostat controls for each one. In addition, because these systems use heat pump technology, they can be used for both heating and cooling. Vacation homes come with their own demands. They have more limited use than your primary residence and can be subject to extreme climates such as in coastline areas or mountains. That’s why we think a ductless mini-split could be a good option thanks to its efficiency, flexibility, and convenience. Ductless mini-splits also use inverter-driven compressors which slow down or speed up based on system demands. By not shutting the compressor down completely, you’re spared the extra power required to restart it. Or maybe your home is older or smaller and not able to support ductwork. In that case, a ductless mini-split is a great alternative to choose exactly how you want to heat and cool your house. Once again, because ductless systems operate individually, there’s no more fighting over the thermostat. In addition, there is no air transferred between rooms. That means smells from the kitchen or smoke from a round of cigars will not spread through the house. If you have a remote thermostat monitoring system, you can check the temperature from anywhere to make sure, for example, it’s not getting too cold during the winter. Or, as you’re driving to your getaway home, you can make sure it’s properly heated or cooled when you arrive. Remember: Ductless systems do have a higher installation cost than traditional ones. That means you’ll want to have a regular maintenance schedule to keep your system running at peak efficiency. Want to learn more about the benefits of ductless air conditioning in Whittier, CA? Contact the pros at Greenleaf Heating & Cooling today!